How many Android apps you have installed? How many of them you really use? 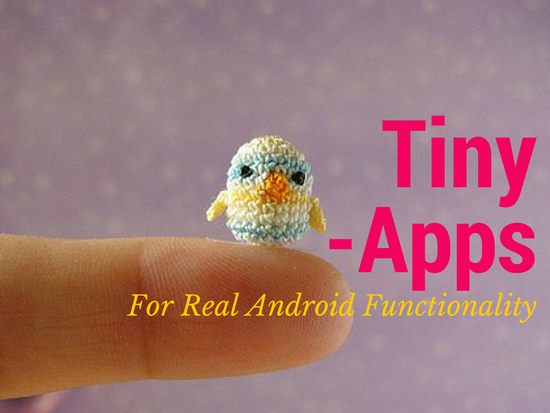 But here are 20 small applications that you will use forever and add huge functionality to your Android. By small, I mean size is few KB and have only one feature. All are free and work on Android 4.0 and above. Whenever you 'Copy' something, no matter which application you are using, Clipper automatically save it. Save Google plus post links, Facebook text, messages, whatsapp updates or anything else. Can merge, view and edit clippings. Trick: If you want to save Google plus posts links to read later, save the link from Google plus application and then merge them. Send to the clip to Evernote. Get them on computer easily. Refined interface, changeable font size and themes. It is a talking clock. Tell you time at predefined interval like every hour, half hour or like. Can set the 'do not disturb' hours. set max and min volume. You have to install English voice extra. The stock android 'Share Menu' is clutter with long list. You can edit and remove the unwanted or never to be used apps from share list. Rename your photos as you want. Read the exif data and rename photos to date and time. Example: if you have snapped the photo on 23 oct 2o14, 12:21 PM, it can automatically rename the photo to 2014-10-23-12-21 or 201410231421 or something like you want. Not everyday, but you will need it at least once. It can format the phone numbers from your contact. Remove spaces, dash, international prefix code or change the international prefix to local or similar. Ex: you can change +91 99 1234 1234 to 09912341234 or to 099 12 34 1234 or +919912341234 or similar. Get every Android notification on desktop Google Chrome browser. Messages, social updates, battery and more. You can read and take action from desktop. Works with Google Chrome only. PIN protected and you have to pair once with browser. You can block time consuming apps. Any app, that you think, waste your time, can be blocked for specific time. You can have different profiles according to user or your taste. Set custom audio notification for charger connect and disconnect. Simple and funny. If you have native notification for charger connect, still you can use it as it has very funny voices. Turn off camera shutter sound completely or similar sounds like low battery, unlock and video recording. Also can 'lock' the volume of every event like media, ring and notification, call, alarm and system. Simple, Google Pixel launcher styled date, time and weather widget. Looks great, works perfectly. Its a floating browser. When you find a link in facebook, google plus or any other application, it will open the link in small floating window. You can minimize it and keep using the main application. When the page loading competes, open the One Tap. Android do not allow you to share APK files across mobiles. Share-it will do it and with WiFi. File transfer is amazingly fast and pairing two mobile is matter of few taps. Allow you to access menu and other phone features in open call. One tap access to Google assistant app. It is just a shortcut, official. Play Music or some other famous music players, do not have default feature to stop playback of music after fixed length of time. It can stop music playback after the predefined time period so that your mobile do not keep playing music even after you fall asleep. It can also support applications other than just music players. Android 4.4 and above version have hidden feature that can show battery percentage inside the battery icon in status bar. Just run the application once. Android Kitkat do not have direct way to toggle Wi-Fi or Bluetooth and other basic settings, which were previously easily controlled from the notification drawer. Now you have to go to setting to do these frequently required tasks. The notification toggle application will give you direct access to this function in notification drawer saving your 5 taps every time. It can stream any audio from your computer to your android mobile. You can put earphone in mobile and use it as a wireless audio of PC. Extremely useful tiny app that will show you memory used by folder structure in a relative visual sizes. You can easily find which folder or file is using more space. Truly different approach to free up space. Along these tiny apps there are many Must Have Free Android Applications , please take a look at this post also. Which other micro applications do you use? Which is your favorite? Share your favorite in the comments. Leave a reply! !